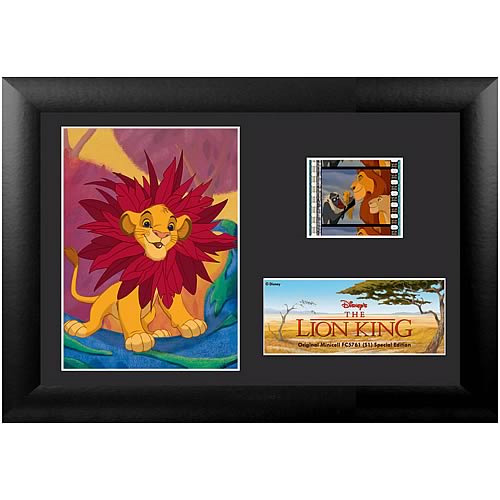 Shopping for Lion King Film Cells? Embark on an extraordinary coming-of-age adventure as Simba, a lion cub who cannot wait to be king, searches for his destiny in the great "Circle of Life." You will be thrilled by the breathtaking animation, unforgettable Academy Award-winning music (1994: Best Original Score; Best Original Song, "Can You Feel The Love Tonight") and timeless story. The film strip portrayed in the image above is only an example of the film cells you may receive. Please note, the cells may vary from piece to piece because they are hand selected from reels of film. This item contains clips of the film and portrays memorable images and scenes all on a stunning descriptive plaque. These elements have been double mounted and placed within a beautiful black wood frame measuring 7-inches x 5-inches. The Lion King Series 1 Special Edition Mini Cell even comes with a certificate of authenticity.